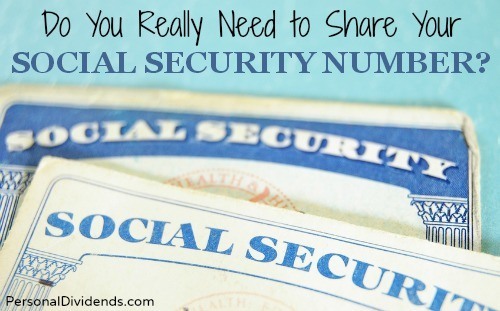 Do You Really Need to Share Your Social Security Number? The last time I went to the doctor, I had to fill out a health form (again) that asked for information about my insurance, as well as about my health situation. One of the empty spaces on the form was for my Social Security number. I left that space blank. I’ve stopped sharing my Social Security number all over the place, just because it’s asked for. I don’t see any reason to share this information, especially with the growing amount of identity fraud happening these days. What happens if the doctor’s office doesn’t properly store or shred the form and other records? My identity could be stolen and I could end up with a serious credit problem on my plate. What Do They Need with Your Social Security Number? Even though the Social Security number wasn’t originally meant to be an identifier, it has become that. For a while, many colleges and universities even used these numbers as student ID numbers (thankfully many schools have moved away from that practice). Even so, some still request your Social Security number as a way to identify you. But some places, like doctor’s offices, schools, and other organizations don’t really need it. Your doctor should be able to use your health insurance information, and schools can create their own numbers. Most of the time, there really isn’t a concrete reason for giving out your Social Security number. Unless you are applying for credit, there really isn’t much need for sharing this information in your every day life. Ask the representative why your Social Security number is needed before you share it. There are times when you do need to provide your Social Security number. When you apply for credit or for a bank account, you are supposed to share this information so that your identity can be verified. When you file your taxes, or apply for government aid programs, you also need your Social Security number. And, of course, you need to provide it when you get a job (don’t give it until you have the job, though; it could be a scam if the “employer” asks for it ahead of time). As a freelancer, I have to share a number all the time on W-9 forms. However, I provide my business Employer Identification Number (EIN). One of the best reasons to get an EIN as a freelancer or other home business owner is so that the places where you share your Social Security number are limited. Without my EIN, I would have had to give my Social Security number to hundreds of clients over the years. That’s more potential for it to be compromised. There are times that you have to provide your Social Security number. However, you don’t need to give it out just because it’s asked for (and you should avoid giving it out when people cold call you, or when they ask for it via email). In many cases, you might be able to use something else, such as the last four digits only, or your driver’s license number. And sometimes you can just ask that they create a number for you. What do you think? Do you give out your Social Security number? My university used SSN as an identifier and on our school ID card, yikes! These days, I never give out my SSN unless convinced there’s an absolute, specific need on behalf of the asker. And then I’d reconsider whether I really need when the asker is selling/providing. What about those of us on Medicare? Our Medicare number is our Social Security number which we have to show every time we have any kind of medical procedure.